The Portland State women's basketball team has wasted no time making itself at home at the Viking Pavilion. The senior-led Vikings have played their first five games of this season at the new arena and won all of them by double digits. Most recent was a 92-79 win over the improved Portland Pilots in a game that featured many of the characteristics that make the Vikings a Big Sky contender. There was Ashley Bolston's near-quadruple double of 19 points, 12 assists, 10 rebounds and nine steals. There was Sidney Rielly's 32 points, 25 in the first half. There were assists on 27 of 33 made baskets, 32 points in the paint, 30 points off turnovers and 19 points after offensive rebounds. Like the nifty new digs, these Vikings are a project several years in the making. Fourth-year coach Lynn Kennedy, whose first PSU team finished 4-26, has a veteran unit that last season reached the conference semifinals. Now the Viks are projected to battle Idaho for the title. The first road games are Saturday at Texas-El Paso and Monday at Grand Canyon. "We can't worry about (expectations)," Kennedy says. "It's just a game. Go out and enjoy it and have fun and enjoy playing with each other." 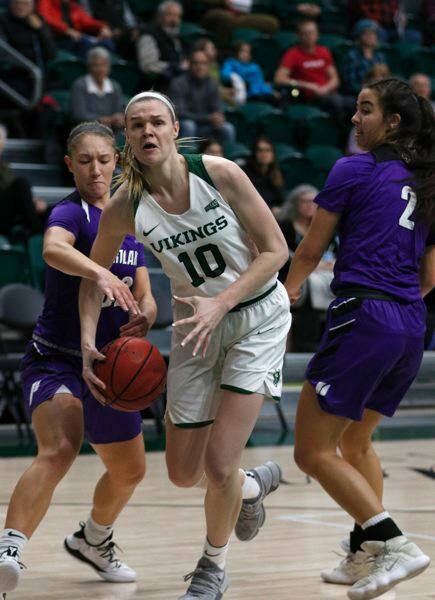 Bolston (career averages of 16.1 points, 4.3 assists), Rielly (career average of 15.9 points) and 6-4 Courtney West (PSU's career leader in blocked shots) are fifth-year seniors in their third season as Vikings. Forward Pia Juhar, a 6-3 senior from Austria, is in her fourth season with the Viks. "Playing together for so many years now, as seniors we've really started to mesh well," Rielly says. Through Sunday, the Vikings ranked third nationally in assists per game (22.8). Point guard Kylie Jimenez, the Big Sky freshman of the year last season, is averaging almost 5.8 assists and 10.8 points per game this season. "I thought she really sparked our second half (against Portland) because she got to the basket and then they started collapsing on her and we could find our posts on the back side," Kennedy says. "We're a tough team to guard because we have so many options." PSU is averaging 81.4 points a game, but defense provides the foundation. With the 6-2 Bolston often stationed at the top of an active zone defense, the Vikings were second nationally through Sunday in opponents' field-goal percentage (28.3 percent). Until the Pilots shot 39.7 percent against PSU (UP was 12 of 32 on 3-pointers), the Viks led the nation in field-goal defense. "Offense is something that we've become known for. In this offseason, we really focused on becoming a stronger defensive team and being able to switch it up from zone to man," Rielly says. "I think that has really improved our ability to get in transition. We scored 92 points (against UP) but a lot of that came from defensive stops and getting out in transition." The Viking defense is tough because four starters — including 6-4 junior forward Jordan Stotler — have long wingspans. Stotler, a transfer who played at Umpqua Community College, can be a defensive presence on the wing or around the basket. "They're disruptive. And they cut hard and they play fast," Portland coach Cheryl Sorenson says of the Vikings, adding that PSU is "loaded with super seniors and a lot of experience, so this is a big year for them to do a lot of damage in the Big Sky." Portland State's fast start has garnered attention beyond the Park Blocks. Last week, PSU was ranked No. 8 in a mid-major poll compiled for ESPN's women's sports website. "We're not sure how that happened, but we are so honored," Kennedy says. "For us to get national recognition from where we came from as a program, we're going to take it, we're going to run with it. It's not going to change who we are. But to be ranked among those teams that have gone to the NCAA Tournament — that's where we want to be. We want to be one of those teams eventually." • Transition year is a good way to describe Sorenson's fifth as the Pilots' coach. Shifting to an uptempo style that suits a guard-oriented roster, Portland has started the season 5-2, with five games on the road, including wins at Utah Valley, Weber State and Hawaii. "We've adopted a new offense, that aggressive mind-set, pushing the pace, just getting up and down the court," says 5-8 senior guard Darian Slaga, who is averaging 17.1 points per game. "Personally, I love it. It's been really effective for us." Slaga and senior 6-2 forward/guard Julie Spencer (15.0 points, 8.3 rebounds) are key pieces. Both soon will reach the 1,000-point career scoring plateau. The Pilots returned seven of their top eight scorers from a 7-23 team. Sophomore guard Maddie Muhlheim out of Sunset High is one of four starters averaging in double figures. Along with Slaga and Spencer, she has helped Portland shoot 35.8 percent from 3-point distance. A key newcomer is freshman Haylee Andrews. The 5-9 guard from Australia has been key to pushing the tempo. Despite being slowed by an injury in the two most recent games (21 minutes vs. PSU), Andrews is averaging 12. 3 points, 5.6 rebounds and 4.0 assists. "She battled to try to go (against PSU). So we'll just rest her and she'll be fine," Sorenson says. "She's so stinking tough, and she was really upset that she couldn't play (at PSU) the way she wanted to. But we've got to learn to play in those situations." Slaga says Andrews has been an engine for the offense. "She's that guard that wants to push the ball up court, and if nobody's going to stop her she's going to take it herself. That's something that we've needed in a point guard," Slaga says. In addition to Andrews, the growth from 5-10 sophomore guard Josie Matz has been notable. On Nov. 28, Matz scored 15 of her career-high 19 points in the fourth quarter to lead a comeback win over Utah State. Uptempo basketball suits Matz, according to Sorenson. "She's always had a high IQ for the game," Sorenson says. "As she continues to get minutes on the floor, she'll take care of the ball, find open shooters and attack and do what she does well." That could sum up this season for the Pilots, who were picked to finish last in the West Coast Conference. Sorenson believes her team will be better than that, but notes that WCC teams were 48-19 in nonconference games through the weekend. "We're hoping to take some big strides," Sorenson says. "I like where we're headed if we keep getting better." Holding their own on the boards and taking care of the ball are areas Sorenson points to as key for this season. In the game at PSU, the Pilots fell behind 13-0, trailed by 16 at one point, then rallied to lead in the second quarter. "I've liked our resilience," Sorenson says. "We started with four on the road at really difficult places. So being able to face some good competition and have some success I think has given us a little bit of confidence." • The men's version of the crosstown rivalry between Portland (5-4) and Portland State (4-3) tips off at 7 p.m. Wednesday at the Viking Pavilion.